In the middle of last night the Great British weather let rip with a vengeance; I was awoken by the orchestrated sounds of buffeting wind and lashing rain. Pity the wild animals on a night such as that. By morning, both wind and rain had abated. Though the scenes to which we awoke could not be said to be cheerful, they were at least calm. Checking today’s forecast did nothing to raise our spirits; from midday onwards our chance of heavy rain varied between 80% and >=95%. Given our track record this year, that equated to a 100% chance of heavy rain. Maybe we’d see something vaguely interesting in the short window of morning remaining after getting everyone ready to leave the cottage. Top daily agenda item following breakfast has been feeding the farm’s waste disposal machines with last evenings vegetable waste. 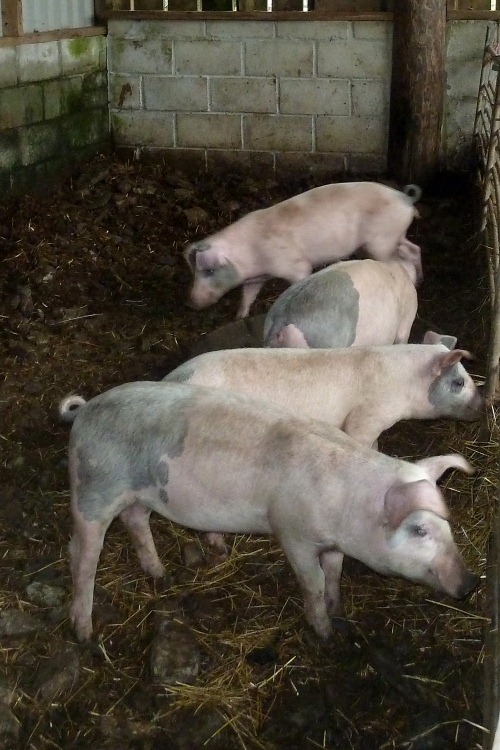 The waste disposal machines in question are six young Gloucestershire Old Spot pigs who get their diet enriched by the resident tourists’ leftovers. For a few years at home, we’ve been collecting raw vegetable waste for throwing into our compost bin. This may save our filling of the rubbish bin but have we done anything with the compost? No. Here is a much better use for vegetable waste, growing sausages and bacon. 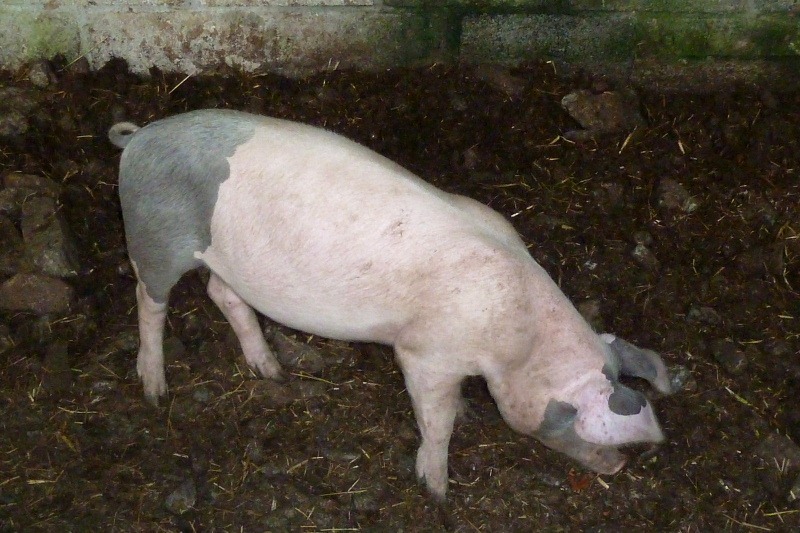 Since the good ol’ BSE epidemic caused by feeding animals back to animals several years ago, the pigs aren’t given any meat products but basically everything else they recycle very effectively. Marvellous idea! Almost as soon as we set out, rain arrived. We popped our noses into a couple of bays north of Bude but to no avail, neither proved suitable for mobility challenged ladies. We surrendered and returned to Crackington Haven where at least the pub would offer a view over the bay and, with luck, another round of crab sandwiches. And so it did, though the sandwiches were less exciting than those from the 16th C. coaching inn at Pendoggett a few days earlier.